S.O.U.L. is grateful to join hands with 2 like-minded social enterprises to make this bag-line possible. 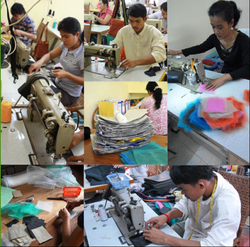 Smateria, LTD, employs Cambodian craftsmen and women using FAIR TRADE principles. They then make something beautiful out of local "trash." We think the symbolism in this is awesome! Trash can be broken down and REPURPOSED, RECYCLED, REUSED for something with a unique purpose, value and beauty...just like us and our tattered hearts, broken souls, and minds. For our premiere collection, we've picked their bags that are made from repurposed mosquito netting. Some items are also lined with repurposed industrial tarp. The bags are then sent to our U.S. Distributer, 5 Accessories. 5 Accessories empowers and delivers "sustainable livelihoods for workers and their communities through the sale of eco-friendly and fair traded, locally made products from 5 countries." They make it possible for us to have the connection we do with Smateria in Cambodia. We clearly thought the bags and everything they represented down to the details were incredible already: the minds that designed them, the hands that created them and how they looked and worked! And now, having carefully chosen a few bags (and other such carrying items) for our Premiere Collection of thesoulbagTM, we've added another incredible dimension (what we think is THE MOST IMPORTANT DIMENSION): with every purchase you make, you are saying "NO" to violence against the human spirit and "YES" to thriving spirits which equals true love and intimate relationships! We invite you to participate in this SOUL LEVEL change with your purchases! CARRY thesoulbagTM, CARRY EACH OTHER.